I love summer and warm weather but I don’t enjoy giving up my third piece. 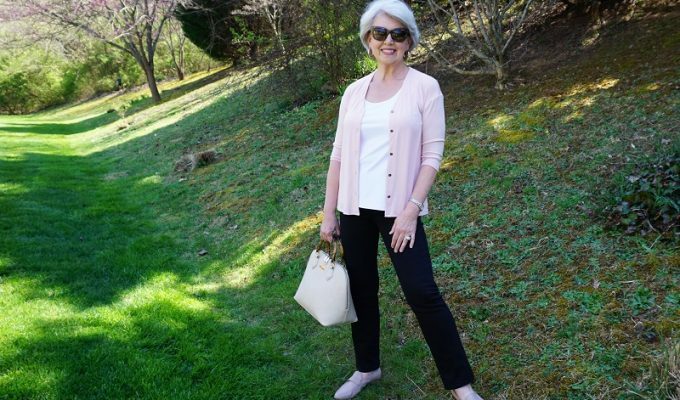 This post shares how I adjust my beloved layers to be more comfortable in the heat. 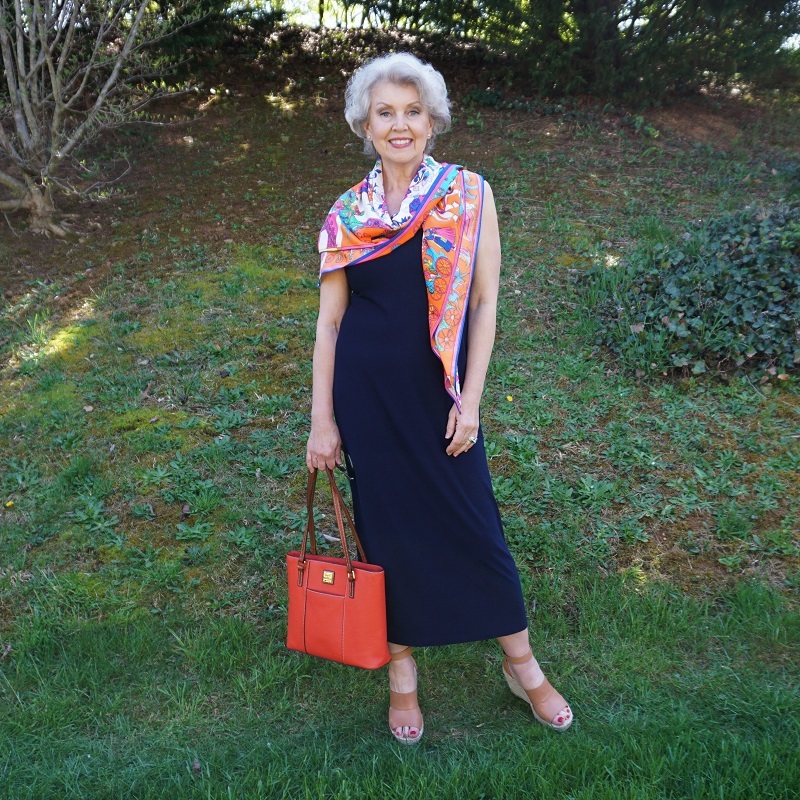 As I will show you in the video at the bottom of this post, I use scarves all year round with my basic lightweight crepe knits. Thank you for the more than five hundred emails to enter the Shapeez give away. One of the things you asked for most often in those emails, was suggestions for swimwear and suggestions for looking our best in hot weather. Keep reading for suggestions for swimwear to flatter different body shapes. The suit above would look good on the woman with a pear shape because it has pattern and color on the top with a defined waistline and a dark solid color on the bottom. Find this suit here. This Swim top (found here) is perfect for the apple shape. Wear it with black swim bottoms of any type including swim shorts. The suit above (found here) will look great on the woman with a small bust. 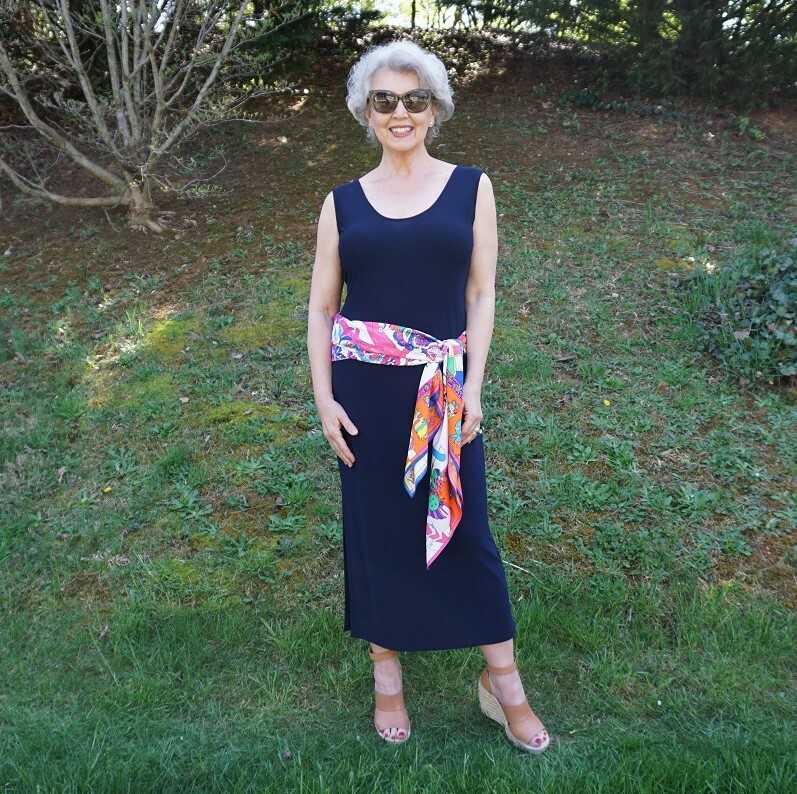 The ruching at the waistline is flattering for all of us women over forty. Those with an inverted triangle shape or an hourglass shape will look great in this suit. (Found here) It has a deep V neckline, sturdy shoulder straps and a crossover detail at the tummy which is very flattering for those of us with a bit of tummy pouch. If I were going to buy a swimsuit this year, it would be the one above. (Found here.) I love the color and the design details which make the waistline appear more slender. The thicker straps support a fuller bust. The high cut legs are perfect for my short legs. The V-neckline is the right choice for my roundish face. Always have an attractive cover-up for after you leave the beach or poolside. I found the one above here. The video below shows some other tips and ideas for bathing suit cover-ups and accessorizing a simple tank dress for hot weather. My shopping site is here. The blog post to show you how to fold a scarf on the bias is here. The WINNERS of the Shapeez bra giveaways are … Susan Hangartner and Summer Hartzog Congratulations! Look for an email telling you how to order your size. Thank you to everyone who entered to win. Have a great weekend. There is no beach or pool in the world that would tempt ME to bare my body at 72. I now even cover my wrinkly arms! I have learned to tolerate heat (live in the humid South, after all). Maybe it is pride, but I just can’t imagine revealing my “dried prune” body. Age catches up with all of us (some quicker than others), and one learns to appreciate what one has and adapt. Others can do as they wish. And I can look the other way. Cheryl, as you say one can do as they wish. On the other hand, I’m 63 with a less than perfect body. My sisters, neices, daughters and granddaughters all take a yearly beach trip to Florida. We are all shapes & sizes and happily don our swimsuits to ENJOY the beach and pool. Life is too short to be concerned someone else doesn’t like how we look in a swimsuit. I totally agree. We all get to make our own choices, and that’s a good thing. But for me, swimming with our children and grands is something I cherish. At 75 I am quite fit, but the years definitely show. I’ll continue to have fun and make memories with the family as long as I possibly can!! Thank you, Susan for the video and great tips today. I might add that the Lands End colorful “Swim Ts” offer great sun protection for the hours in the pool. Thanks for sharing that Maria! I’m going to buy one of those. I wear the “Swim Ts” as cool sun protection for summer walks and kids’ sporting events, too. Together with a wide-brim hat, the high neck and long sleeves they offer great cover. That’s as I was planning to wear them. We have a pool in the neighborhood, but I’ve never been in it. Love these options. Number 4 is my favorite. Lands End and L.L. Bean have some good options as well. One great thing about being older is not caring what others think. Enjoy life! Cheryl, there are so many options these days to wear to the beach or pool. I haven’t worn a bathing suit in over 20 years, but I have found alternative separates like nylon boy shorts and tankinis as one example. These, as well as traditional bathing suits, can be worn with lightweight sheer coverups such as a kimono, jacket or short or long coverup. I live in a hot, dry climate and this year my clothing purchases have included loose fit nylon pants in navy, black and olive, wide-leg crop pants, straight leg stretch denim jeans rolled up at the ankle, wide strap tank tops, cotton peasant tops, kimonos, lightweight windbreakers and thin cardigans. A pair of cute flats, white sneakers or strappy sandals and I’m out the door. Being over the age of 60 just inspires me to be more creative in my choices. I own one swimsuit and have worn it at pools and the beach for 10 years. It is only worn a few times each summer. The one thing I wear with it that I would not be seen without is a swim skirt. There are several places these can be purchased separate from a swimsuit. I think a swim skirt would look great with any of the above swimsuits. I feel modest and appropriate for my age of 70 when wearing it. It allows me to swim and enjoy the pool and beach while still maintaining my comfort zone. I always think about what my family might be thinking even though they don’t say anything. But that’s just how I operate. I think perhaps some misunderstood my comment–I do not care what others think so much as my caring to look my personal best. Angie, for example, does what I do–comes up with cooler, loose-fitting clothes, when appropriate. I grew up on the Gulf Coast and know that one can highly enjoy the public beach without a swimsuit. I am in my 70’s, and, for me, that is a whole different animal as far as what I choose to reveal than just a decade ago. People were wanting swimsuit choices to look their best, and I was just saying that my personal best could not reveal that much skin. And, Nelda, I do enjoy life–tremendously. This is somewhat of a difficult topic, one that we saw addressed in the recent Gillette kerfuffle (although there it was weight, not wrinkly, flabby skin). But what one chooses to do personally is up to them and others should not make assumptions about them. Assuming that Cheryl doesn’t enjoy life and is wrapped up in what others think simply because she refuses to wear a bathing suit is patronizing. Actually, most dermatologists warn us against exposing too much skin and, since there are other options out there, those who choose that route may be wise. I have read that the late Dixie Carter, a Southern beauty, happened to agree that with age, one should cover more. Angie, yes there are many options. Recently, I challenged myself. I love a good challenge!! So, I put on a frumpy outfit and took a photo. That was my way of pushing myself. It worked, lol. I learned what doesn’t work. Currently, I am trying different proportions, fabrics and styles. Angie, your selection of clothing sounds fun, practical and cool for hot temps. While I don’t want to wear a swimsuit either, I don’t want to miss fun with family. So many cute cover-ups and accessories. I might try a suit, even if I sit in the shade cuz I really like the way Susan uses large scarves for coverage. Thanks Susan! I certainly don’t “like” my appearance in a swimsuit. I never wear shorts, sleeveless tops, etc. However, I live in Sun City, Texas, an over-55 golf course community with about seven pools (indoors & out). Most of the people here have wrinkles, veins on their legs that show, etc. I feel comfortable in our pools and having the right swimsuit so that cleavage doesn’t show makes all the difference. Thanks for another season of great ideas, Susan. Ha ha! Lucky winner initials!! “SH” What fun! I couldn’t repeat that trick if I tried! I was only looking at email addresses when I picked them. Thank you for giving swimsuit and cover-up suggestions. Congratulations to your winners! Obviously, running the occasional contest is a great way to generate potential blog topics as well as new blog readers. I’m new to this blog and look forward to reading it. 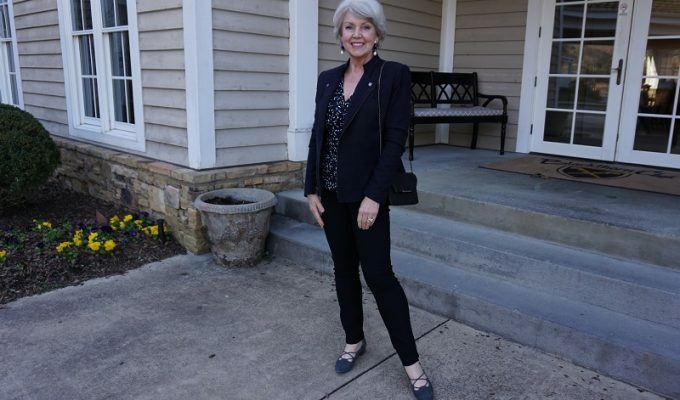 Susan, you always have such a lovely smile and pleasant look that is a reminder to me that a happy countenance is a big part of looking stylish. I had to laugh when I read one of your older posts where you said you don’t watch tv and I thought that might be your secret, 🙂 and all the fun you and Mr Mickey have as well. Love to be taken along on your adventures. You are also a great reminder to stand tall with shoulders back. I do that when I’m looking in the mirror and some how later in the day, I’m slumped again. You look great in this dress and I wish you had it petite. Your Ancient Scene scarf is so beautiful. It looks like I could have picked it up in a very nice shop in Santa Fe. Thank you for the beautiful additional scarf as well. The fabric is just so rich and I love the colors. The different options to tie scarves came at just the right time. Those will work beautifully in ac this summer, and don’t take up as much room as a jacket or sweater. I am so glad you choose to share your wisdom with us. 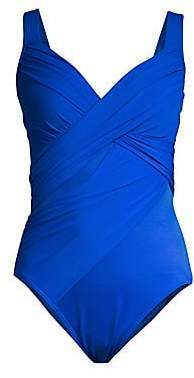 I’ve found swimming tops and longer board shorts at http://www.swimsuitsforall.com they cover enough of my 71-year-old body so I can enjoy the beach and pool without feeling self-conscious. They also have cover-ups that are not too hot. “Real women” post pictures of themselves in this sites beach wear rather than 20-year-old models! I find the best way to enjoy a swim and not be bothered by our many corrugations and wrinkles is to put your cossies on and dont look in the mirror. Especially the back view. Works for me as a 70 year old aussie nanna who spent her youth in the sun before we knew we shouldn’t. Thanks a bunch! I was one of your followers who asked for summer, cooler options and this fits the bill. Excellent ideas! Thanks again! You are a goddess. Thank you so much for generously sharing such useful, inspirational information. Based on previous posts, I finally organized my closet and purses in the manner you showed. I am unable to articulate how much this has improved my day-to-day life, appearance and mood. My only regret is waiting so long to take action. I enjoy your blog. In the photo above with the scarf draped over your shoulder, how do you keep the scarf in place? I’ve used this look many times but have yet to find an acceptable way to keep the scarf from sliding off. It does move around with my movements, but I just push it back where it belongs. I always wear scarves in a casual, nonchalant way, but you could use smooth magnets to keep them in place. Wish I looked as good in sleeveless as you do…I just don’t have the nerve any more!!! I found and bought Esther Williams swimwear about 10 years ago when I was determined to find a suit to wear at my 30 year high school reunion (in the Florida Keys, almost no way to avoid swimwear altogether). I loved the swimdress and now own several. I see they are now available on Amazon and Unique Vintage. I’m apple shaped and love that the style I got starts to flare from under the bust (empire like). I highly recommend them. The movie-star one piece with boy legs and ruching is lovely (reminds one of Marilyn Monroe), but my tummy needs more camouflage. I bought the shorter version of the dress and a couple of scarves from you site even before I finished watching your video. I love scarves but seemed to be missing a good, neutral “canvas” like the dress. They arrived today and I’m so pleased with them. Everything was carefully packaged to survive unscathed through a rainstorm, and I especially appreciate the bonus scarf. It was in my top picks, but I had rationed myself to two; imagine how pleased I am that it’s in my S/S color palette and goes seamlessly into my wardrobe. I’m so glad you are pleased with your purchase! Thank you for shopping with me. I just bought your navy dress. I love it. Is it ok to hang it up or should it be folded? Great swimsuit ideas, too! I hang my dress on a felted hanger. Machine wash it in cold water and hang it to dry. Don’t put it in the dryer. Thank you for shopping with me! I just went to Dillards and they had an excellent selection of suits for us ‘mature’ ladies (I just turned 70). We are going on a family vacation this summer with kiddos and Grandkiddos, so a new suit was in order. Their short skirt/tankini combinations worked great for me……..and another lady, similar age and size found several one piece suits that looked great on her (our body types were totally different). So I would highly recommend Dillards if you need to find a great swimsuit (and I have NO affiliation! ).